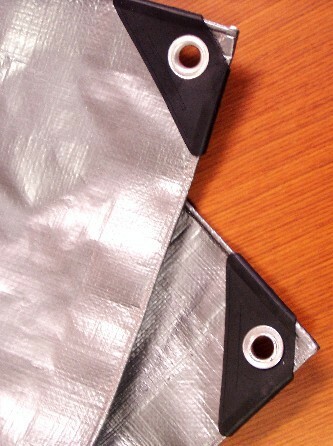 PRODUCT: Silver Tarp, 50 x 100 ft, Heavy Duty, Premium UV Grade. 14x14 Weave, 1000 Denier / 6 oz. Price/Tarp. 14 X 14 WEAVE HDPE WOVEN CENTER. 6.0 OZ / SQ. YARD BASE FABRIC, U.V. RESISTANT. GROMMETS ABOUT EVERY 18" AND IN ALL CORNERS. OPTIONS: Other sizes from 6 to 100 feet in various shapes.